Social media: What's your policy? One of the great liberating things about social media as a communications channel is that anyone can do it. But, for a business this is both a blessing and a curse. It’s a curse because any of your employees could be using social media in a way that does not benefit the business or even worse, in a way that may be sabotaging it. On the other hand it’s a blessing, as all those employees could be a collective force for good – adding significantly to the marketing effort and engaging directly with customers and prospects, providing an authentic voice for the company. This is where a social media policy comes in – an essential document that should promote, guide and control. There have been many incidents in the past year or so where employees have posted inappropriately to social media. Here are ten people who paid the price for stupid social media behaviour. Unfortunately, a policy won't help when the transgressor is the owner of the company. And a policy won't stop someone determined to go into total meltdown. What is the purpose of a social media policy? It has two main strands that you can think of as the carrot and the stick. A good policy should explain the strategy and thinking behind the organisation’s use of social media, actively encourage people to take part and give them a clear coherent framework within which to post. It should also, however, explain the kind of behaviour that won’t be tolerated and the disciplinary measures that might follow inappropriate action. One of the key points to emphasise is “If in doubt – don’t post’ accompanied by who to ask for a second opinion on a proposed post. Although it should be designed as a means of controlling conduct, overall the tone should not be negative and prohibitive but positive and encouraging. If you have existing guidelines on email etiquette, phone use or business communications, that’s a good place to start. Take a look at those policies and adapt them for social media – this can then form the basis of the ‘stick’ strand. Make sure the new policy doesn’t contradict any other company policies. Do some research, check out all the case studies of social media gaffes you can find on the Internet and ask yourself if they could happen in your organisation. Then draw up appropriate guidelines to do as much as possible to prevent them from happening. There are plenty of policy examples available on the web - look at these and work out which elements are appropriate for your organisation, rewrite if necessary - don't just lift it wholesale. Make sure you understand what activity would be beneficial to the business and what would be harmful – this will be different for different businesses. First of all you need to decide on the scope of the policy, does it just cover social media? Does it cover any form of digital communication or does it cover all forms of communication? What areas of business should be considered commercially sensitive and the need to protect confidential or proprietary information. The importance of a clear statement on whether your social media account is personal or a company account. A statement regarding the public nature of social media and the organisation’s intention to monitor it. 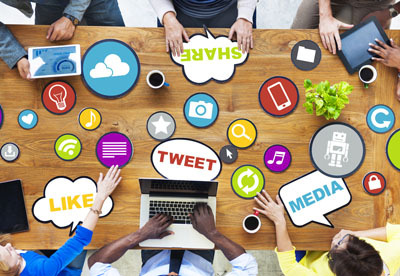 Include guidelines on the use of social media in the workplace and on mobile devices. Employees should not be spending time updating their own accounts just to interact with friends during working hours. What behaviour is unacceptable and why – with examples, This should cover racism, equal opportunity, respect for the customer etc. What actions will be taken against employees who contravene the policy. What to do if an employee makes a mistake with a post – who to inform, what to do. Assure employees that honest mistakes will not be penalised, but emphasise the quick and open notification of issues. The importance of copyright and intellectual property issues - employees should check they have the right to post images etc. A brief overview of the legal issues around social media – explaining that the laws of libel, defamation etc, still apply to social media. Try and keep the document as positive as possible. Brief senior management on the need for a policy, run through the proposed policy and make sure senior management are behind it. Publicise it internally – especially with managers and communicators. Hold a launch event for the policy – to make sure everyone hears about it and recognises it’s importance to the organisation. Make it part of the induction process. Carry out a programme of training – how to use social media under the policy. This should include some live role-playing of different situations. (These exercises could also be used to decide which employees would be suitable for a more active spokesperson role). This training must include management, it is essential they have the skills to manage the issues around managing social media. Bear in mind that the vast majority of faux pas are due to ignorance rather than malice, so training is your best weapon against costly mistakes. Distribute the comprehensive policy, but more importantly, create a summary of the main points and publicise that in posters, videos etc. If issues come up early in the roll out – use them as examples to illustrate the importance of following the policy and don’t be too harsh on employees. If an infraction of the policy is committed by an employee – and this is bound to happen sooner or later – your organisation will be judged by the manner in which it handles the incident. Remember that it is important to be monitoring social media constantly and comprehensively – you want to be one of the first to spot an issue rather than the last to hear of it. A social media policy is not a ‘nice-to-have’ document, it is an essential first step to sensible engagement in social media. With a policy as your safety net, you are free to make the most of the medium and use it’s powerful alchemy for the good of your organisation.